Finding skincare to suit your skin is like finding a great pair of jeans. It can be hard to find, but once you get the right fit, you breathe a sigh of relief! That is how I felt when I first used the Oily Skin Essentials Kit from Bloom Skin Essentials. A line of products that's gentle, effective and geared toward my troublesome oily skin? Oh, you shouldn't have! But I'll take it! So what does this amazing Essentials Kit include? Let's take a look. I love a good exfoliator. This exfoliator however, is fantastic. One of the great things about some of these products from Bloom Skin Essentials, is that you can use them multiple ways! This polish can be used mixed with water or Glow (also included in this kit). 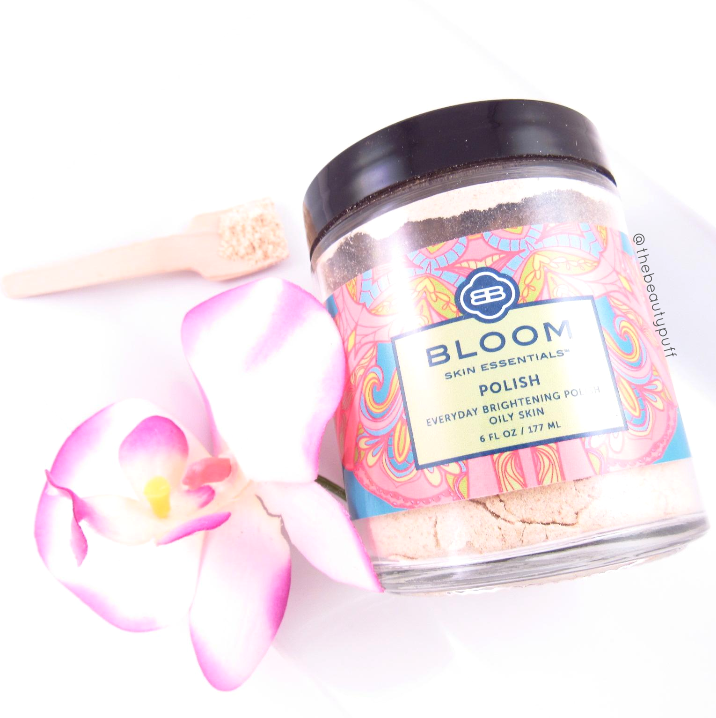 This polish exfoliates with rice and whole milk powder. Rice powder also absorbs dirt and oil. It is finely ground so there is no harsh scratching or irritation on the skin. It's gentle enough to use both morning and night. In the morning, I typically use the Polish with just water. This helps increase circulation and gives my skin a fresh start for the day. At night, I love using it with Glow. What is Glow? Imagine a nourishing, cleansing, and hydrating tonic you can use a multitude of ways to benefit your skin. That's Glow! You can mix Glow with the Polish described above for a rich cleanser, leave the mixture on your skin as a mask, or use Glow on its own as a makeup remover or body moisturizer. It comes in a glass bottle with a pump for easy dispensing so you can get just the right amount for your skin. I never need more than two pumps of Glow at a time. A little goes a long way! My favorite way to use Glow is by mixing in a bit of Polish and a splash of water. The tiny bit of water just helps to evenly distribute the mixture over the skin. Once rinsed off, my skin is so soft it feels as if I've just moisturized. My skin is left incredibly smooth and supple. This tonic easily dissolves makeup, making it easy to remove so your skin is fresh and ready for our next step, hydration. To quench my skin's thirst during the day, Bloom's Hydrate mist is perfect. There are many days I do not wear a full face of makeup and this mist provides hydration throughout the day to give my skin a boost. It's come in really handy because it is a quick, sanitary way to freshen my skin. It contains key vitamins to nourish, soothe, and protect. Whether in the midst of summer heat or the dry, cold days of winter, this refreshing spray gives instant, cooling moisture your skin will love! At the end of the day what's better than a fresh, clean face? A fresh, clean, hydrated face! This little miracle in a bottle lives up to its name. It is total and complete nourishment for your skin. This little beauty comes tailored to your specific skin type. 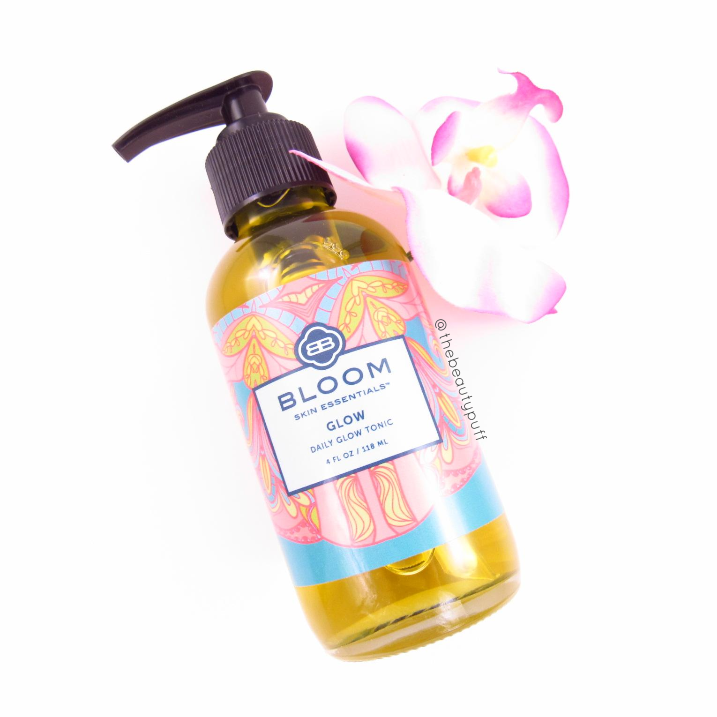 Dry, combination or oily, Bloom has you covered. The oily skin version comes packed with essential fatty acids and vitamins to balance oil. It also has antibiotic/antiseptic properties, calms, and helps to restore and protect skin. I would say I use 5-6 drops of this at night to cover my entire face and a bit down my neck. It really is a soothing sensation when you apply face oils. Knowing that this oil has amazing benefits for my oily skin makes it feel even better! The one place you might say skincare is "one size fits all" is the delicate eye area. Regardless of your skin type, this delicate area needs special attention. This eye cream is soft to the touch and takes no time to melt into your skin. It features organic ghee which helps nourish, strengthen, and rejuvenate the under-eye area. Another key ingredient is Roman Chamomile which reduces inflammation, something we can all use on those days we get little sleep! As with the other products from Bloom, this eye cream can be used multiple ways. You can add a touch of this cream to fine lines and even on your lips to provide a smooth canvas for lip products. I personally use it as an eye cream and have been loving its rich, smooth texture. 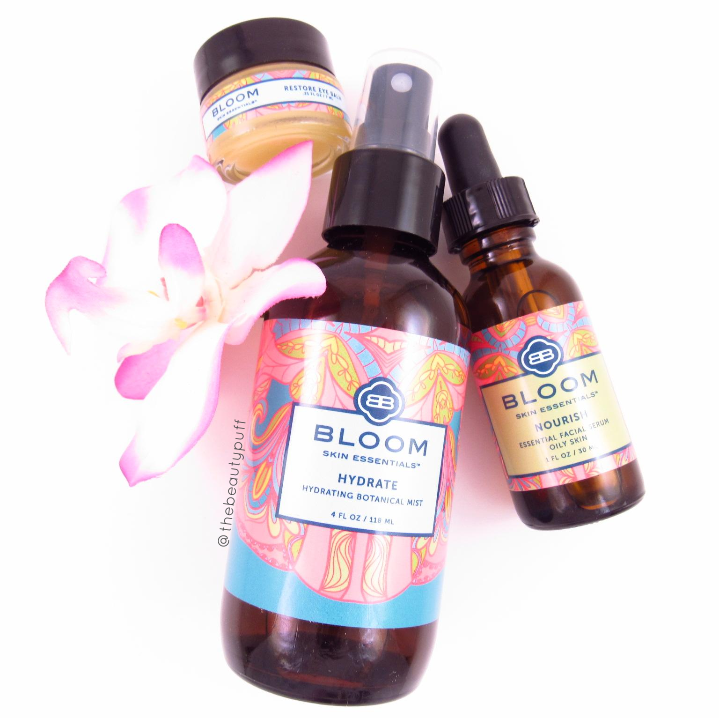 Whether you choose one product or indulge in the entire Essentials Kit, your skin will love these products from Bloom Skin Essentials. The calming aromas, smooth formulas and natural ingredients are truly addicting. I look forward to cleansing and moisturizing my skin every day thanks to these products!